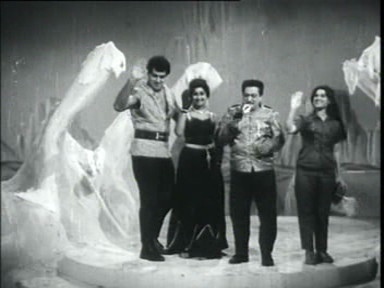 Chand Par Chadayee or Trip to Moon is a 1967 space opera featuring Dara Singh and Anwar Hussain along with a bevy of lovelies (Ratna, Padma Khanna, Helen, Kanchanamala to name a few). Director T.P Sundaram didn’t let lack of technology or the laws of science stop him. 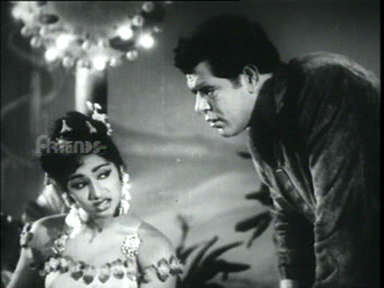 On those rare occasions when Dara Singh takes a break from wrestling, there are loads of fab songs by Usha Khanna. 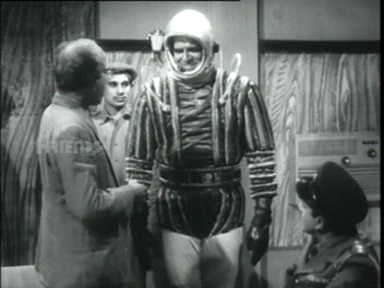 It’s a long but engaging interplanetary caper complete with super special effects. Well done to Neo Filmo Crafts (credited with the set properties) and the design team! And yes, there will be lots of screencaps. 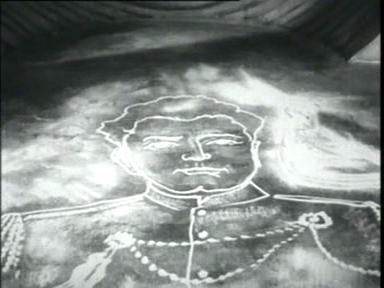 I saw this on an unsubtitled VCD so I have made up a lot of the story but I do not feel a void where the details were missed. I wish there had been a void where the ‘Friends’ logo obscured much of the picture. Eminent scientist fellow (S Nazir I think) leaves the top secret research tent to follow a bright light – clearly a torch in someone’s hand as they run behind the papier mache rocks. 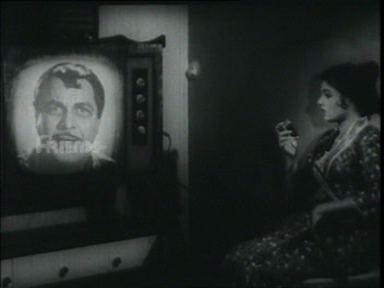 He is taken aback when a vampy lady appears and sings a typical filmi nightclub song, and also surprised when she transforms into Padma Khanna as a moon girl with a ray gun. 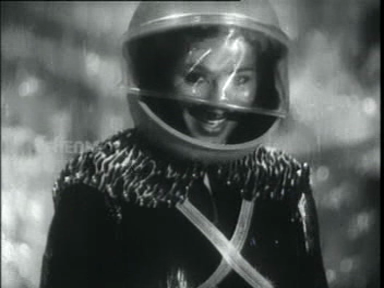 There is a nice touch of Marvin the Martian at Christmas about her outfit. He is abducted in a cardboard spaceship and never seen again. 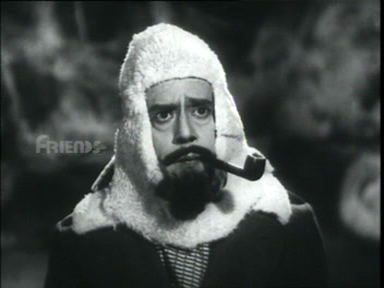 And that establishes an enduring costuming theme. 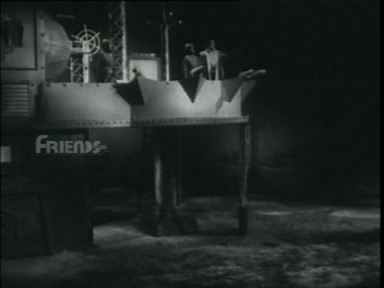 Anand and Bhagu are taken to the Moon (where they were going anyway) as prisoners. 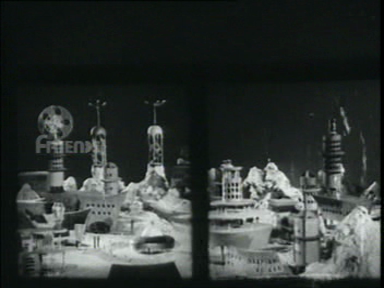 They pass by another planetary base (maybe Mars) where Barahatu (Anwar Hussain) fires missiles from his balcony. 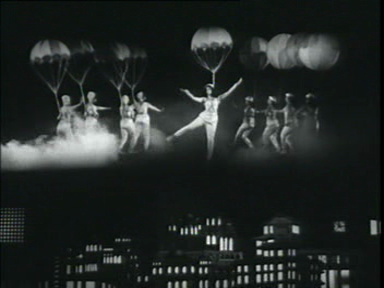 Fancy flying – hard when you’re piloting something as aerodynamic as a cupcake- sees the ship safely to the moon where Anand meets Shimoga (Ratna). The moon has balloon trees! 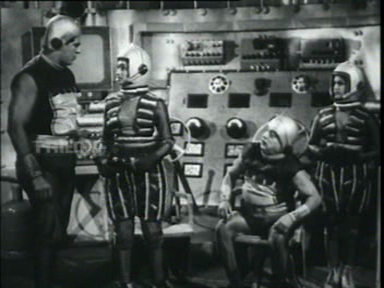 After a bit of slow motion moonwalk (the Neil Armstrong kind), the locals put special anti-comedy soles on the Earthmen’s boots and they can walk normally. 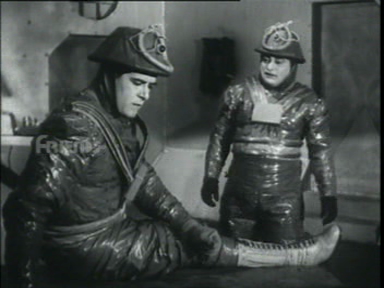 Anand and Bhagu are jailed and forced to wear matching romper suits. 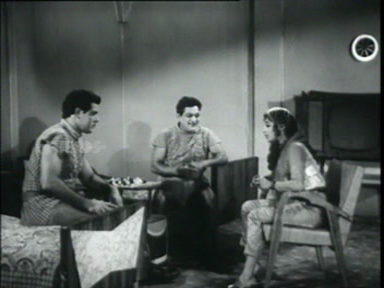 Shimoga visits Anand in jail but he refuses to cooperate. After a tribunal hearing of some sort, Anand is sentenced to trial by Space Gorilla Wrestling, followed by being dragged by (space) horses. 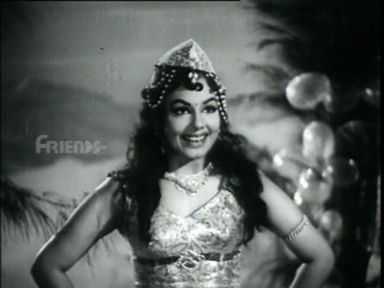 Of course Anand wins, and Princess Shimoga is delighted. 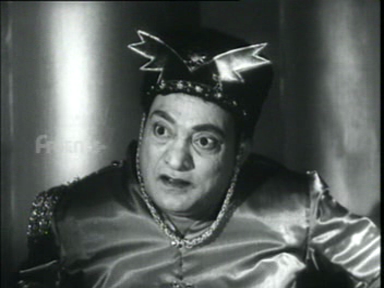 It turns out Barahatu wants to marry Shimoga and is at war with the Moon people. 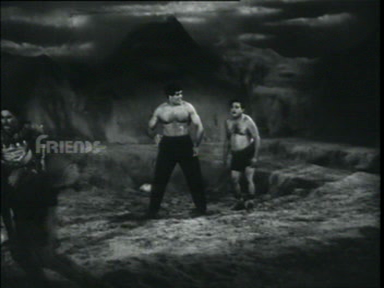 Space becomes just a backdrop for a standard two guys fighting over a girl story. 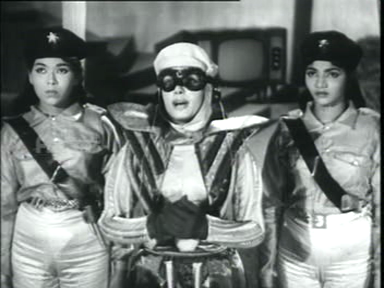 There is also a fair amount of moon lady interest in Captain Anand and they are not shy about showing their mettle. Dance offs including that thing where they make a portrait with their feet! There is double crossing, slapstick, jetpacks, kidnapping, guys in animal suits, more kidnapping, robots and fights galore. People casually hop in and out of rockets and nip across space with no more effort than catching a taxi. It all plays out as you would expect although not always exactly as logic might dictate. Among many highlights, Dara wears some fetching outfits. He has many many many wrestling scenes. 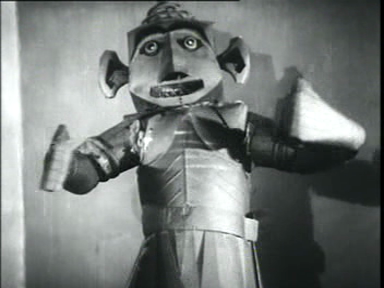 Barahatu is not totally evil. 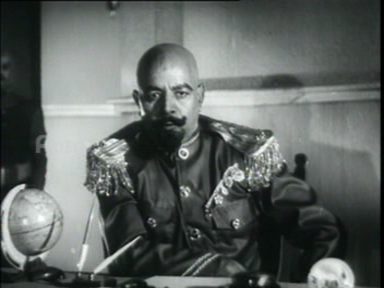 He seems to want Shimoga to like him, or at least accept marriage (I think). Unfortunately he takes advice from Master Bhagwan( in a duplicate role as Barahatu’s comedy sidekick) so success is not likely. 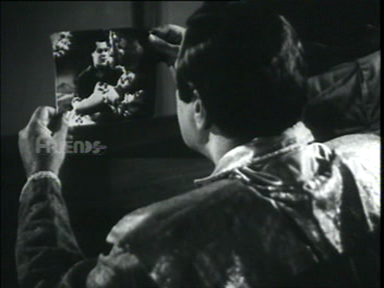 He gets Helen in to do the twist, in a mistaken belief that what gets him in the mood will work on her. 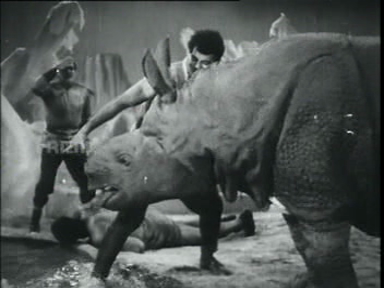 And I enjoyed this photoshop effort when Barahatu was having a tantrum over Anand and Shimoga getting cosy. 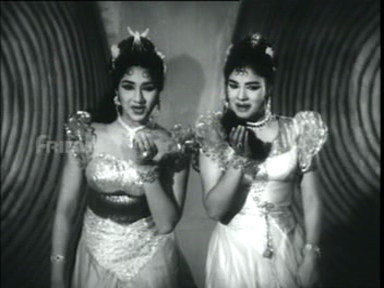 The lovely Shimoga (Ratna) also has lots of fetching outfits and makes the most of the fab Usha Khanna soundtrack. Shimoga is a determined young lady so she doesn’t just sit around waiting to be rescued. She goes after Anand and I think points out that if he marries her he can ensure peace between worlds, but whatever. 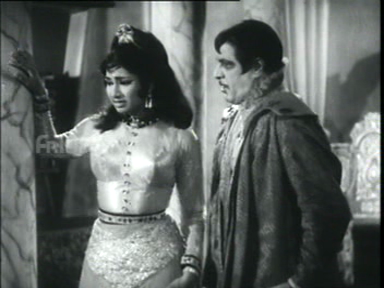 Padma Khanna is lots of fun as Simi, the scheming sidekick to Barahatu. 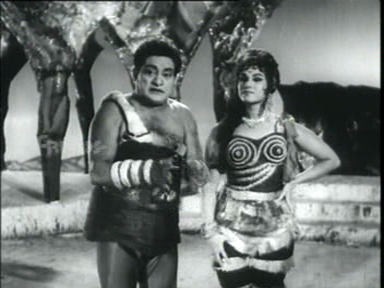 She seems keen on Anand and wants to help Barahatu get Shimoga so she can swoop on the lone earth man. I may have made that up but she did seem to take extra care when drugging him unconscious. She kidnapped Anand’s mother and sister so that may have hurt her prospects. But really – her ‘disguise’ screamed bad girl so Ma should have been suspicious. 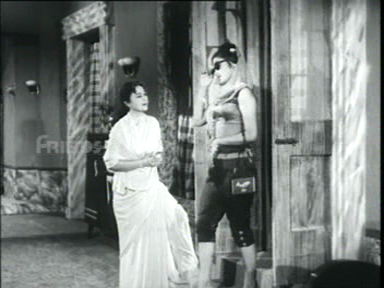 She shares a lot of scenes with Palki (Kanchanamala). 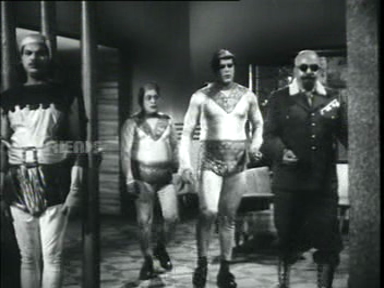 Poor Palki ends up married to Bhagu and is instrumental in saving the world. 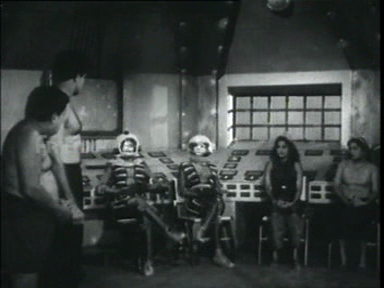 It’s tough being a female sidekick in space, even if you do get to keep a zoo in your bathroom (or at least a lion and a leopard). 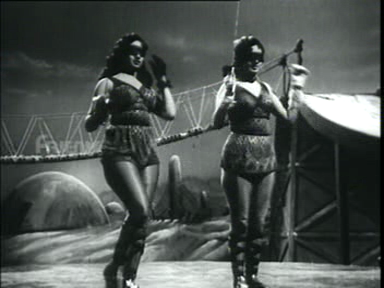 She and Simi have a knock down drag out scrag fight in a pivotal scene. They really tried to get wrestling in as much as possible. 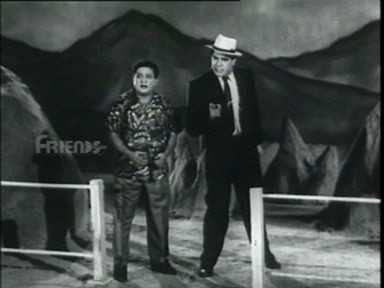 Bhagu gets silly hats and a comedy song with excellent outfits. 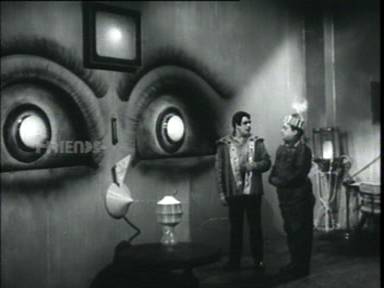 Master Bhagwan is fairly amusing but the slapstick was repetitive and the film is already a bit too long. 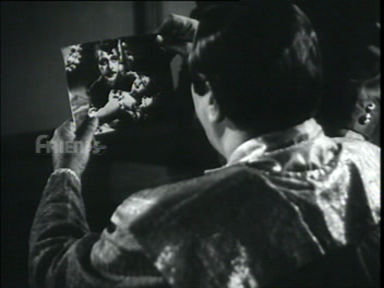 But I liked that he and Anand depended on each other and he helped more than he hindered. The Moon King gets some great outfits too. 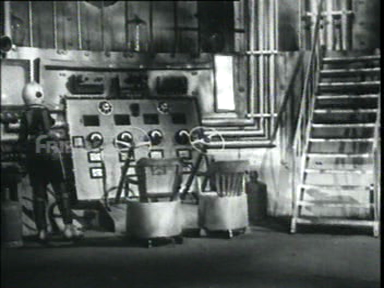 The set design is charming in that almost everything looks like it was designed to be in another film –a nightclub, a grand house, a castle dungeon, an office chair – but they tried very hard to ‘space’ it up. 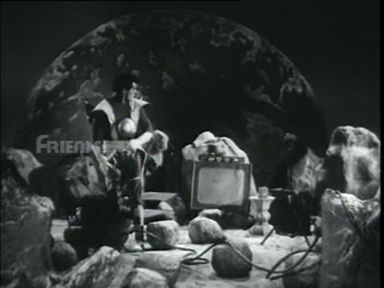 I really loved Anand’s secret space hideout. 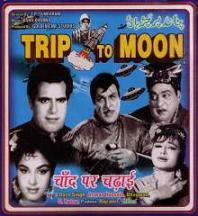 Trip to Moon is highly entertaining even if the fights are repetitive. 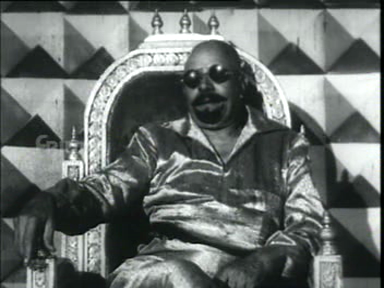 T.P Sundaram gave Dara Singh a range of wrestling scenarios and wasn’t stingy with the song and dance either. If you enjoy films with likeable characters, good music, a dedicated hat department and lots of miniature spaceships and buildings, this is for you! 3 stars! 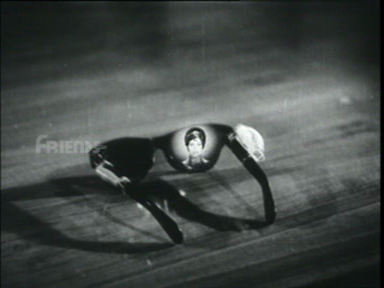 This entry was posted in Bollywood and tagged Adventures without subtitles, Anwar Hussain, Bollywood, Chand Par Chadayee, Dara Singh, Helen, Hindi, Kanchanamala, Master Bhagwan, Padma Khanna, Ratna, T.P Sundaram, Trip to Moon, Usha Khanna. Bookmark the permalink. I myself feel aerodynamic as a cupcake after all the Christmas eating. WHEN OH WHEN will I finally see this film? Hi there, greetings from Sydney, Australia. I am so glad I have found someone who has enjoyed the film just like I did. The ‘Door Na Ja Jaane Wafa’ scene is perhaps my favourite one.